DIE Martis, 18o Novembris, 1740. "I acquainted you, at the Close of the last Session of Parliament, that I was making Preparations for carrying on the just and necessary War in which I am engaged, in the most proper Places, and in the most vigorous and effectual Manner: For this Purpose, strong Squadrons were got ready, and ordered to sail upon important Services, both in The West Indies and Europe, with as much Expedition as the Nature of those Services, and the manning of the Ships, would admit: A very considerable Body of Land Forces was embarked, which is to be joined by a great Number of My Subjects raised in America; and all Things necessary for transporting the Troops from hence, and carrying on the designed Expedition, were a long Time in Readiness, and waited only for an Opportunity to pursue the intended Voyage. "The several Incidents which have happened in the mean Time have had no Effect upon Me, but to confirm Me in My Resolutions, and to determine Me to add Strength to My Armaments, rather than to divert or deter Me from those just and vigorous Meafures which I am pursuing, for maintaining the Honour of My Crown, and the undoubted Rights of My People. "The Court of Spain, having already felt some Effects of our Resentment, began to be sensible that they should be no longer able alone to defend themselves against the Efforts of the British Nation; and if any other Power, agreeably to some late extraordinary Proceedings, should interpose, and attempt to prescribe or limit the Operations of the War against My declared Enemies, the Honour and Interest of My Crown and Kingdoms must call upon us to lose no Time in putting ourselves into such a Condition, as may enable us to repel any Insults, and to frustrate any Designs formed against us, in Violation of the Faith of Treaties: And I hope any such unprecedented Steps, under what Colour or Pretence soever they may be taken, will inspire My Allies with a true Sense of the Common Danger, and will unite us in the Support and Defence of the Common Cause. "The great and unhappy Event of the Death of the late Emperor opens a new Scene in the Affairs of Europe, in which all the principal Powers may be immediately or consequentially concerned; it is impossible to determine what Turn the Policy, Interest, or Ambition, of the several Courts may lead them to take in this critical Conjuncture. It shall be My Care, strictly to observe and attend to their Motions, and to adhere to the Engagements I am under, in order to the maintaining of the Balance of Power, and the Liberties of Europe; and, in Concert with such Powers as are under the same Obligations, or equally concerned, to preserve the public Safety and Tranquillity, to act such a Part as may best contribute to avert the imminent Dangers that may threaten them. "I have ordered Estimates to be prepared, and laid before you, for the Service of the ensuing Year. It is always with Regret that I ask any extraordinary Aids of My People; but what I have already mentioned must be sufficient to satisfy you that some Augmentations will be necessary, not only for carrying on the present War with Vigour, but also to put ourselves in a Condition of being prepared for such Events as may arise in this new and uncertain State of Europe: I therefore depend on your experienced Zeal and Affection for Me, and My Government, your Concern for your own Safety, and the Support of the common Cause, to grant Me such effectual Supplies as may be requisite for these great Ends. "The Scarcity of Corn, which has happened in many Countries of Europe, has induced several Powers to make extraordinary Provisions to obviate the ill Effects of that Misfortune; and though in many Parts of this Kingdom the Harvest has proved more favourable, yet common Prudence calls upon us to provide, as far as may be, against the Approach of such a Calamity: Besides, in our present Circumstances, it would be an inexcusable Neglect, to suffer our Enemies to be supplied with any Kind of Provisions from My Dominions, and that even at the Hazard of My Own Subjects being distressed: Let me therefore earnestly recommend it to you, to consider of some good Law, to prevent this growing Mischief. "The Difficulties which have been found in manning the Fleet, by the usual Methods hitherto practised, demonstrate the Want of some Parliamentary Remedy: I must therefore press it upon you, to lose no Time in making such Provisions in this respect, as, whilst we are engaged in a War in Defence of the Commerce and Navigation of this Kingdom, may enable the Publick to avail itself of those great Numbers of Seamen which make so valuable a Branch of our Strength. "The Importance of these Considerations is so apparent, that I need use no Arguments to convince you of the Necessity of the utmost Unanimity and Dispatch in your Proceedings." Their Lordships having (together with Mathias Lord Bishop of Chichester, at the Table) first taken the Oaths, and made and subscribed the Declaration, and also taken and subscribed the Oath of Abjuration, pursuant to the Statutes. It was moved, "To resolve, That an humble Address be presented to His Majesty, returning Him the Thanks of this House, for His most Gracious Speech from the Throne. "To congratulate His Majesty on His safe Return to His Regal Dominions; to assure His Majesty that we will stand by Him, with our Lives and Fortunes, in a vigorous Prosecution of the just and necessary War in which He is engaged. 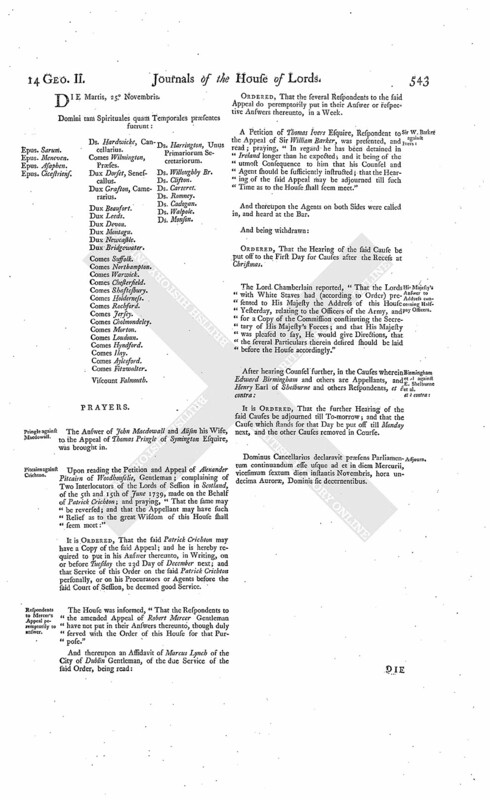 "And, as a further Proof of our Duty and Affection to His Majesty's Sacred Person, Royal Family, and Government, to assure Him, that we will exert ourselves, in our high Capacity of Hereditary Great Council of the Crown (to which all other Councils are subordinate and accountable), in such a Manner as may best tend to the promoting the true Interest of His Majesty and our Country in this critical Conjuncture." Then it was likewise moved, "To order, That an humble Address be presented to His Majesty, to return Him the Thanks of this House, for His most Gracious Speech from the Throne. "To acknowledge His Majesty's great Wisdom, and His Adherence to the true Interest of His Kingdoms, in resolving to carry on this just and necessary War, in the most proper Places, and in the most vigorous and effectual Manner; and in not suffering Himself to be diverted or deterred from those Measures. "To give His Majesty the strongest Assurances, that, if any Power should attempt to prescribe or limit the Operations of the War against His declared Enemies; such an extraordinary Proceeding would not fail to create a just Indignation in us, and determine us to concur in all proper Measures for vindicating and defending His Dignity and Honour against any Insults, and frustrating any Designs formed against us. "To assure His Majesty, that this House will zealously stand by and support Him, in adhering to the Engagements He is under, for maintaining the Balance and Liberties of Europe, on the Event of the late Emperor's Death, as well as in the Prosecution of the present War. "To express our unshaken and unalterable Fidelity and Affection to His Majesty's Person and Government; and our ardent Wishes, that all His Enterprizes for maintaining the Honour of His Crown, and the Rights of His People, may be blessed with Success." The previous Question was put, "Whether the Question first stated shall be now put?" Protest against rejecting the First Motion. "1st, Because we conceive that a Motion of this Nature ought not to have been laid aside by the previous Question; but we apprehend it would have been more consistent with the Honour and Dignity of this House to have passed it in the Affirmative, since it contained the strongest Assurances of our Duty to His Majesty, and of our Zeal to support Him, with our Lives and Fortunes, in the Prosecution of this just and necessary War. Moreover, it had been universally allowed in the Debate, that the antient Usage of this House was, to return immediately a general Address of Thanks only for the Speech from the Throne, and to appoint a future Day for taking the said Speech into Consideration: By which wise Method of Proceeding, this House had an Opportunity of forming their Judgement, and offering their Advice to the Crown, upon the several Matters contained in the Speech, after due Inquiry and mature Deliberation. "2dly, Because, though the Speech from the Throne is, in Parliament, justly considered as the Act of the Ministers; yet a Motion preconcerted, if not drawn by themselves, echoing back the Particulars of the Speech, is, as we conceive, a modern Expedient, to procure a precipitate Approbation of Measures which might not be approved upon better Consideration. It was indeed alleged in the Debate, in Support of this Practice, that it was introduced, during the late War, in the Administration of the Earl of Godolphin; but we should also consider the Reason of it (we heartily wish we had now the same), that the Zeal of the House was then every Year animated by the glorious Successes of the Queen's Arms, under the Command of the Duke of Marlborough. And though it is always admitted, that these hasty Addresses do not preclude the House from future Inquiries or Censures; yet, should Censures, in Consequence of such Inquiries, become necessary, they would produce an Inconsistency between the First Address and the subsequent Resolutions, and argue a Levity highly unbecoming the Wisdom and Dignity of this House. "3dly, Because One Part of this Motion, the Congratulation upon His Majesty's safe Return to His Regal Dominions, could be liable to no Objection; but seemed at this Time peculiarly reasonable, since it was evident to the whole Kingdom, the sailing of that Fleet, which had been delayed so long, was the immediate Effect of His happy Return. "4thly, Because we conceive, that our assuring His Majesty we would exert ourselves in our high Capacity of Hereditary Great Council of the Crown, would have given Encouragement to His Allies, Confidence to His Armies, and Satisfaction to His Subjects, especially in this critical Conjuncture, wherein the Advice of this House is more than ever necessary, since, by the Inaction of this last Year in all Parts (except where Admiral Vernon commanded), notwithstanding the vast Fleets and Armies maintained at so immense a Charge, this just and necessary War seems hitherto to have been carried on by the same Spirit and Advice which so long delayed the entering into it; and we conceive, that the strictest Inquiries into such Conduct are the most probable Means of redressing our Grievances at Home, and bringing the War Abroad to a speedy and happy Conclusion. 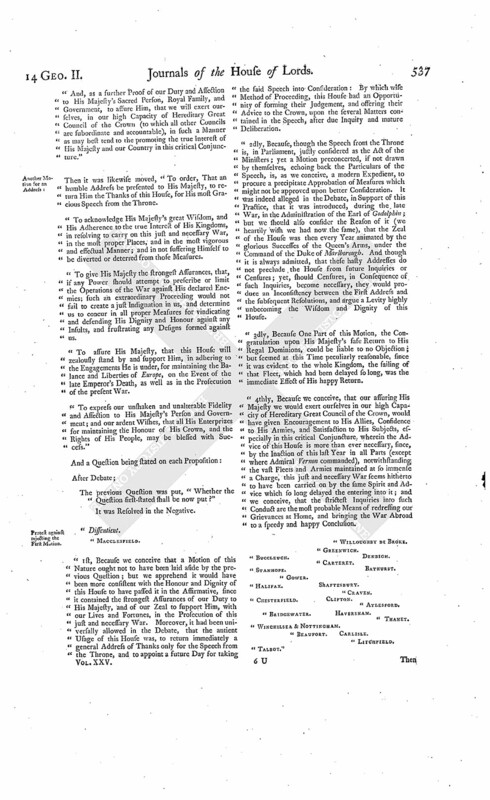 Then it was proposed, "To insert, in the second-stated Question, immediately before the last Paragraph, these Words; (videlicet,) ["And, as a further Proof of our Duty and Assection to His Majesty's Sacred Person, Royal Family, and Government, to assure Him, that we will exert ourselves, in our high Capacity of Hereditary Great Council of the Crown, in such a Manner as may best tend to the promoting the true Interest of His Majesty and our Country in this critical Conjuncture." Protest against rejecting an Amendment to the Second Question. 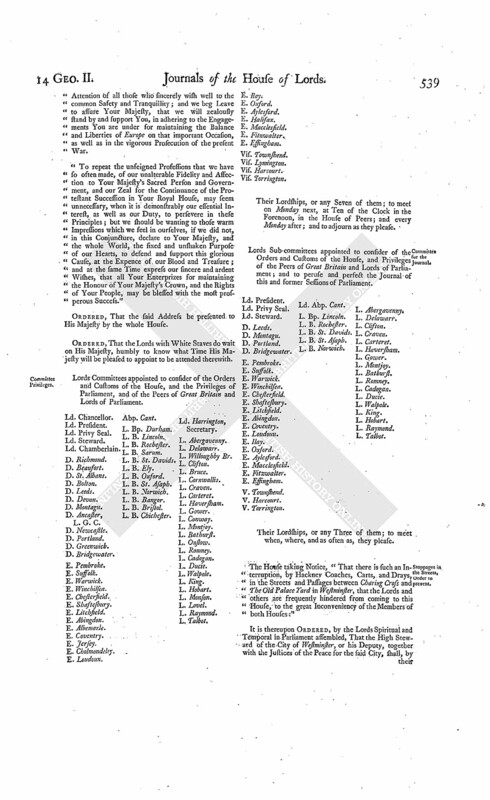 "Because, when these Words made Part of the Question first moved, they were allowed, by every Lord who spoke in the Debate, to be proper and unexceptionable; and the following Parenthesis only ("to which all other Councils are subordinate and accountable") was objected to, as liable to a Misconstruction in another House: We cannot therefore but be surprized, that when this Question, freed from that Shadow of an Objection, as we conceive, was offered as an Amendment to the Motion for the Address, it should have been rejected; and the more so, since the Negative passed upon it may be construed to imply, what we are persuaded no Lord in this House can intend (whatever others may wish), a Resolution not to inquire, advise, or censure, even though just Suspicions, imprudent Councils, or criminal Measures, should require it. Committee to draw the Address. E. Ilay. L. B. St. Asaph. L. B. Chichester. Ld. Delawarr. Their Lordships, or any Five of them; to meet presently, in the Prince's Lodgings near the House of Peers; and to adjourn as they please. And the Earl of Holderness reported from the said Committee, "That they had prepared an Address, pursuant to the aforementioned Resolution." "The Resolution which Your Majesty is pleased to express, for carrying on this just and necessary War in the most proper Places, and in the most vigorous and effectual Manner, is so agreeable to Your Royal Wisdom, as well as to the united Desires of Your People, that it fills our Hearts with the most grateful Sentiments. As The West Indies has been the Scene of the most outrageous Depredations and Violences committed by the Spaniards upon Your Majesty's Subjects, we hope and trust that, by the Blessing of God on Your Majesty's Councils and Arms, this Nation will, in those Parts more especially, obtain that just Satisfaction for past Injuries, and essectual Security for their Navigation and Commerce for the future, which have hitherto been refused, contrary to the Faith of the most solemn Treaties. "We must ever acknowledge it amongst the many Instances of Your Majesty's Firmness and true Greatness of Mind, that you have not suffered any Incidents whatsoever to divert or deter You from these Measures. And we doubt not but Your Enemies will soon be convinced, that the Security of Your Majesty's Government at Home must be strengthened in the Affections and Support of Your People, whilst Your Squadrons are sent to distant Parts of the World, as well for maintaining their undoubted Rights and Interests, as the Honour of Your Imperial Crown. "Under this deep Sense of our Obligations to Your Majesty, permit us to offer, at Your Royal Feet, the strongest Assurances, that if any other Power should attempt to prescribe or limit the Operations of the War against Your declared Enemies, such an extraordinary Proceeding would not fail to create in us the highest and most becoming Indignation, and to determine us to concur in all proper Measures for vindicating and defending Your Majesty's Dignity and Honour against any Insults, and for frustrating any Designs formed against us. "We are truly sensible that the Death of the late Emperor is an Event which calls for the vigilant Attention of all those who sincerely wish well to the common Safety and Tranquillity; and we beg Leave to assure Your Majesty, that we will zealously stand by and support You, in adhering to the Engagements You are under for maintaining the Balance and Liberties of Europe on that important Occasion, as well as in the vigorous Prosecution of the present War. "To repeat the unfeigned Professions that we have so often made, of our unalterable Fidelity and Affection to Your Majesty's Sacred Person and Government, and our Zeal for the Continuance of the Protestant Succession in Your Royal House, may seem unnecessary, when it is demonstrably our essential Interest, as well as our Duty, to persevere in these Principles; but we should be wanting to those warm Impressions which we feel in ourselves, if we did not, in this Conjuncture, declare to Your Majesty, and the whole World, the fixed and unshaken Purpose of our Hearts, to defend and support this glorious Cause, at the Expence of our Blood and Treasure; and at the same Time express our sincere and ardent Wishes, that all Your Enterprizes for maintaining the Honour of Your Majesty's Crown, and the Rights of Your People, may be blessed with the most prosperous Success." L. B. Chichester. Ld. Harrington, Secretary. 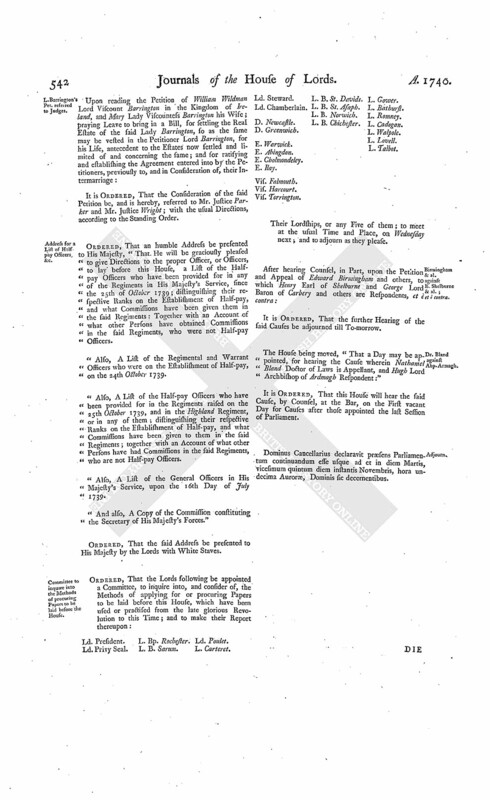 Lords Sub committees appointed to consider of the Orders and Customs of the House, and Privileges of the Peers of Great Britain and Lords of Parliament; and to peruse and perfect the Journal of this and former Sessions of Parliament. The House taking Notice, "That there is such an Interruption, by Hackney Coaches, Carts, and Drays, in the Streets and Passages between Charing Cross and The Old Palace Yard in Westminster, that the Lords and others are frequently hindered from coming to this House, to the great Inconveniency of the Members of both Houses." Dominus Cancellarius declaravit præsens Parliamentum continuandum esse usque ad et in diem Mercurii, decimum nonum diem instantis Novembris, hora undecima Auroræ, Dominis sic decernentibus. The Lord Steward acquainted the House, "That the Lords with White Staves had (according to Order) waited on His Majesty, humbly to know what Time He would be pleased to appoint to be attended, with their Lordships Address; and that His Majesty had been pleased to appoint this Day, at Two a Clock, at His Palace of St. James's." Private Bills, Time limited for Petitions. Ordered, That after the 15th Day of January next this House will not receive any Petition for a Private Bill, during this Session of Parliament. 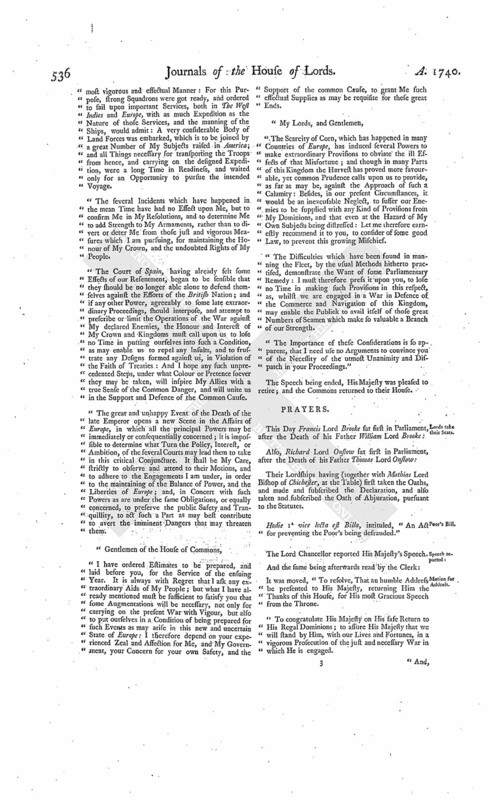 Upon reading the Petition and Appeal of Kenneth McKenzie, Ensign in General Anstruther's Regiment, Second lawful Son of Sir Kenneth McKenzie of Cromarty; complaining of an Interlocutor of the Lords of Session in Scotland, of the 17th of July last, made on the Behalf of William Urquhart of Meldrum Esquire, and others the Creditors Pursuers of the Process and Action of Sale of the Estate of Cromarty, brought at the Instance of the said William Urquhart and of the Creditors; and praying, "That the same may be reversed; and that the Appellant may have such Relief as to this House in their great Wisdom and Judgement shall seem meet:"
It is Ordered, That the said William Urquhart and Creditors may have a Copy of the said Appeal; and they are hereby required to put in their Answer or respective Answers thereunto, in Writing, on or before Wednesday the 17th Day of December next. Dominus Cancellarius declaravit præsens Parliamentum continuandum esse usque ad et in diem Lunæ, vicesimum quartum diem instantis Novembris, hora undecima Auroræ, Dominis sic decernentibus. Dux Ancaster, Magnus Camerarius Angl. "I thank you for this most dutiful and affectionate Address. Nothing can be more agreeable to Me, than the Zeal you express for the vigorous Prosecution of this just and necessary War, the Support of My Dignity and Honour, and the Preservation of the Balance and Liberties of Europe; all which I have entirely at Heart." Ordered, That the said Address and Answer be forthwith printed and published. D. St. Albans takes the Oaths. 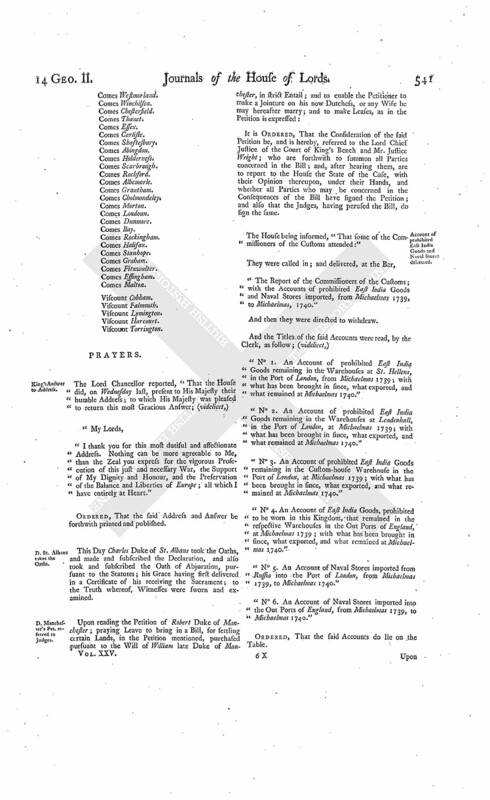 This Day Charles Duke of St. Albans took the Oaths, and made and subscribed the Declaration, and also took and subscribed the Oath of Abjuration, pursuant to the Statutes; his Grace having first delivered in a Certificate of his receiving the Sacrament; to the Truth whereof, Witnesses were sworn and examined. D. Manchester's Pet. referred to Judges. 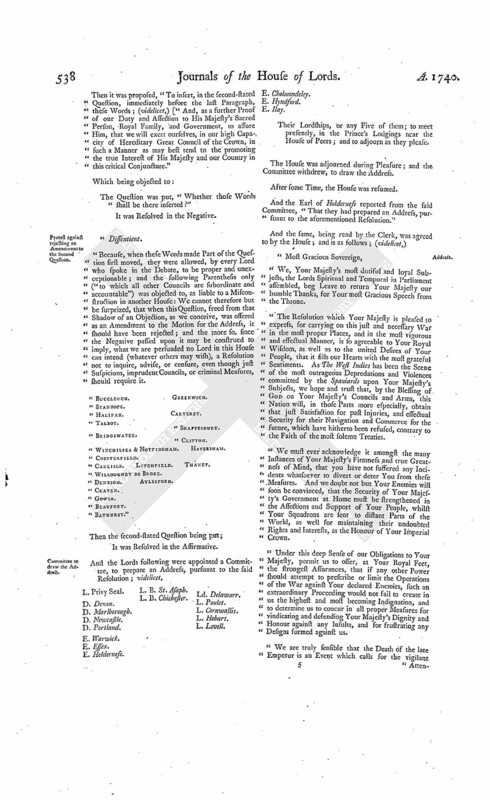 It is Ordered, That the Consideration of the said Petition be, and is hereby, referred to the Lord Chief Justice of the Court of King's Bench and Mr. Justice Wright; who are forthwith to summon all Parties concerned in the Bill; and, after hearing them, are to report to the House the State of the Case, with their Opinion thereupon, under their Hands, and whether all Parties who may be concerned in the Consequences of the Bill have signed the Petition; and also that the Judges, having perused the Bill, do sign the same. Account of prohibited East India Goods and Naval Stores delivered. "The Report of the Commissioners of the Customs; with the Accounts of prohibited East India Goods and Naval Stores imported, from Michaelmas 1739, to Michaelmas, 1740." "No 1. An Account of prohibited East India Goods remaining in the Warehouses at St. Hellens, in the Port of London, from Michaelmas 1739; with what has been brought in since, what exported, and what remained at Michaelmas 1740." "No 2. An Account of prohibited East India Goods remaining in the Warehouses at Leadenhall, in the Port of London, at Michaelmas 1739; with what has been brought in since, what exported, and what remained at Michaelmas 1740." "No 3. An Account of prohibited East India Goods remaining in the Custom-house Warehouse in the Port of London, at Michaelmas 1739; with what has been brought in since, what exported, and what remained at Michaelmas 1740." "No 4. An Account of East India Goods, prohibited to be worn in this Kingdom, that remained in the respective Warehouses in the Out Ports of England, at Michaelmas 1739; with what has been brought in since, what exported, and what remained at Michaelmas 1740." "No 5. An Account of Naval Stores imported from Russia into the Port of London, from Michaelmas 1739, to Michaelmas 1740." "No 6. An Account of Naval Stores imported into the Out Ports of England, from Michaelmas 1739, to Michaelmas 1740." L. Barrington's Pet. referred to Judges. Address for a List of Half pay Officers &c.
Ordered, That an humble Address be presented to His Majesty, "That He will be graciously pleased to give Directions to the proper Officer, or Officers, to lay before this House, a List of the Halfpay Officers who have been provided for in any of the Regiments in His Majesty's Service, since the 25th of October 1739; distinguishing their respective Ranks on the Establishment of Half-pay, and what Commissions have been given them in the said Regiments: Together with an Account of what other Persons have obtained Commissions in the said Regiments, who were not Half-pay Officers. "Also, A List of the Regimental and Warrant Officers who were on the Establishment of Half-pay, on the 24th October 1739. 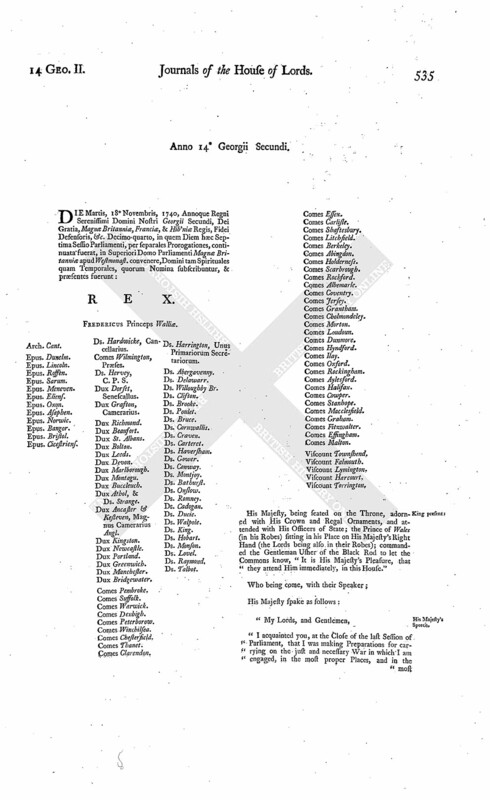 "Also, A List of the Half-pay Officers who have been provided for in the Regiments raised on the 25th October 1739, and in the Highland Regiment, or in any of them; distinguishing their respective Ranks on the Establishment of Half-pay, and what Commissions have been given to them in the said Regiments; together with an Account of what other Persons have had Commissions in the said Regiments, who are not Half-pay Officers. 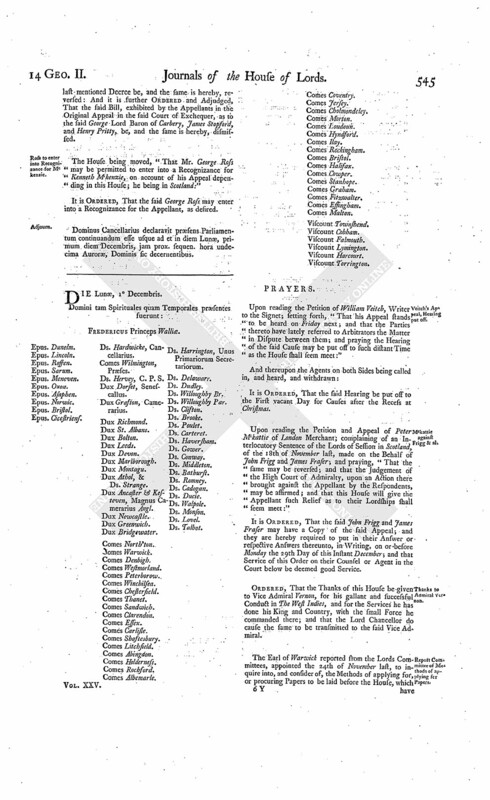 "Also, A List of the General Officers in His Majesty's Service, upon the 16th Day of July 1739. "And also, A Copy of the Commission constituting the Secretary of His Majesty's Forces." Committee to inquire into the Methods of procuring Papers to be laid before the House. L. B. Chichester. Ld. Poulet. Birmingham & al. against E. Shelburne & al. ; et è contra. It is Ordered, That the further Hearing of the said Causes be adjourned till To-morrow. Dr. Bland against Abp. Armagh. The House being moved, "That a Day may be appointed, for hearing the Cause wherein Nathaniel Bland Doctor of Laws is Appellant, and Hugh Lord Archbishop of Ardmagh Respondent:"
It is Ordered, That this House will hear the said Cause, by Counsel, at the Bar, on the First vacant Day for Causes after those appointed the last Session of Parliament. Dominus Cancellarius declaravit præsens Parliamentum continuandum esse usque ad et in diem Martis, vicesimum quintum diem instantis Novembris, hora undecima Auroræ, Dominis fic decernentibus. The Answer of John Macdowall and Alison his Wife, to the Appeal of Thomas Pringle of Symington Esquire, was brought in. Upon reading the Petition and Appeal of Alexander Pitcairn of Woodhouselie, Gentleman; complaining of Two Interlocutors of the Lords of Session in Scotland, of the 5th and 15th of June 1739, made on the Behalf of Patrick Crichton; and praying, "That the same may be reversed; and that the Appellant may have such Relief as to the great Wisdom of this House shall seem meet:"
It is Ordered, That the said Patrick Crichton may have a Copy of the said Appeal; and he is hereby required to put in his Answer thereunto, in Writing, on or before Tuesday the 23d Day of December next; and that Service of this Order on the said Patrick Crichton personally, or on his Procurators or Agents before the said Court of Session, be deemed good Service. Respondents to Mercer's Appeal peremptorily to answer. The House was informed, "That the Respondents to the amended Appeal of Robert Mercer Gentleman have not put in their Answers thereunto, though duly served with the Order of this House for that Purpose." A Petition of Thomas Ivers Esquire, Respondent to the Appeal of Sir William Barker, was presented, and read; praying, "In regard he has been detained in Ireland longer than he expected; and it being of the utmost Consequence to him that his Counsel and Agent should be sufficiently instructed; that the Hearing of the said Appeal may be adjourned till such Time as to the House shall seem meet." His Majesty's Answer to Address concerning Half-pay Officers. The Lord Chamberlain reported, "That the Lords with White Staves had (according to Order) presented to His Majesty the Address of this House Yesterday, relating to the Officers of the Army, and for a Copy of the Commission constituting the Secretary of His Majesty's Forces; and that His Majesty was pleased to say, He would give Directions, that the several Particulars therein desired should be laid before the House accordingly." It is Ordered, That the further Hearing of the said Causes be adjourned till To-morrow; and that the Cause which stands for that Day be put off till Monday next, and the other Causes removed in Course. Dominus Cancellarius declaravit præsens Parliamentum continuandum esse usque ad et in diem Mercurii, vicesimum sextum diem instantis Novembris, hora undecima Auroræ, Dominis sic decernentibus. Ld. Dudley takes his Seat. Ferdinando Lord Dudley sat first in Parliament, after the Death of his Cousin William Lord Dudley and Ward; his Lordship having, at the Table, taken the Oaths, and made and subscribed the Declaration, and also taken and subscribed the Oath of Abjuration, pursuant to the Statutes. Sir John Gordon to amend his Appeal. A Petition of Sir John Gordon of Embo Baronet, was presented, and read; setting forth, "That, through the Mistake of his Agent below, his Appeal, brought last Session of Parliament, is either not fully stated, or misrepresented; by reason whereof, some Advantage might be taken against the Appellant by the Respondent, if the same is not properly amended;" and praying, That the Petitioner may be at Liberty to amend his said Appeal in a proper Manner." Ordered, That the Petitioner be at Liberty to amend his said Appeal; he amending the Respondent's Copy. Walkinshaw peremptorily to answer Forbes's Appeal. The House was informed, "That James Walkinshaw had not put in his Answer to the Appeal of Samuel Forbes of Knappernie, though duly served with the Order of this House for that Purpose." Dr. Bland against Archbishop Armaghet al. 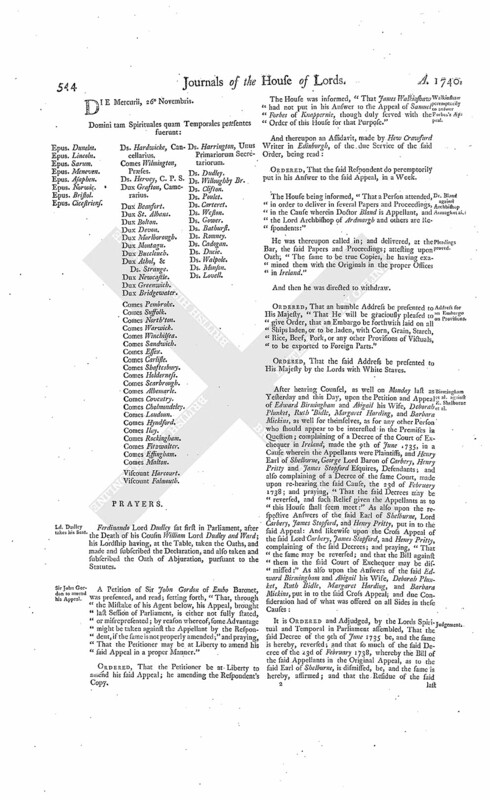 The House being informed, "That a Person attended, in order to deliver in several Papers and Proceedings, in the Cause wherein Doctor Bland is Appellant, and the Lord Archbishop of Ardmargh and others are Respondents:"
He was thereupon called in; and delivered, at the Bar, the said Papers and Proceedings; attesting upon Oath, "The same to be true Copies, he having examined them with the Originals in the proper Offices in Ireland." Address for an Embargo Provisions. Ordered, That an humble Address be presented to His Majesty, "That He will be graciously pleased to give Order, that an Embargo be forthwith laid on all Ships laden, or to be laden, with Corn, Grain, Starch, Rice, Beef, Pork, or any other Provisions of Victuals, to be exported to Foreign Parts." Birmingham et al. against E. Shelburne et al. 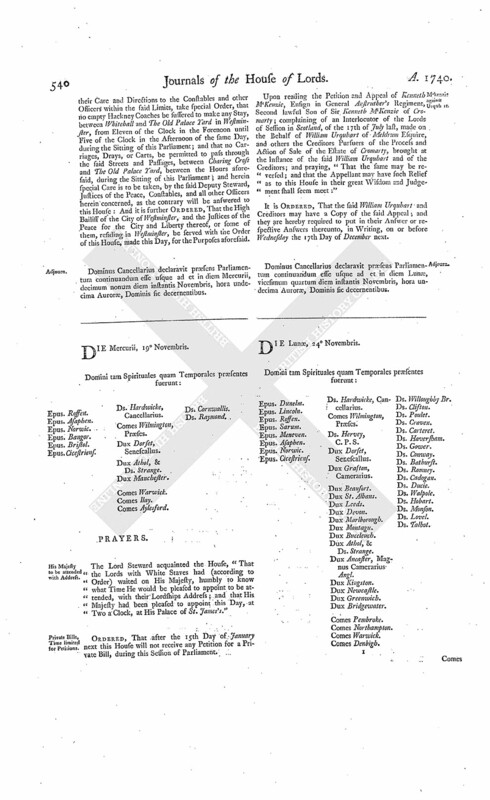 It is Ordered and Adjudged, by the Lords Spiritual and Temporal in Parliament assembled, That the said Decree of the 9th of June 1735 be, and the same is hereby, reversed; and that so much of the said Decree of the 23d of February 1738, whereby the Bill of the said Appellants in the Original Appeal, as to the said Earl of Shelburne, is dismissed, be, and the same is hereby, affirmed; and that the Residue of the said last mentioned Decree be, and the same is hereby, reversed: And it is further Ordered and Adjudged, That the said Bill, exhibited by the Appellants in the Original Appeal in the said Court of Exchequer, as to the said George Lord Baron of Carbery, James Stopford, and Henry Pritty, be, and the same is hereby, dismissed. Ross to enter into Recognizance for Mckenzie. The House being moved, "That Mr. George Ross may be permitted to enter into a Recognizance for Kenneth Mckenzie, on account of his Appeal depending in this House; he being in Scotland:"
It is Ordered, That the said George Ross may enter into a Recognizance for the Appellant, as desired. Dominus Cancellarius declaravit præsens Parliamentum continuandum esse usque ad et in diem Lunæ, primum diem Decembris, jam prox. sequen. hora undecima Auroræ, Dominis sic decernentibus.